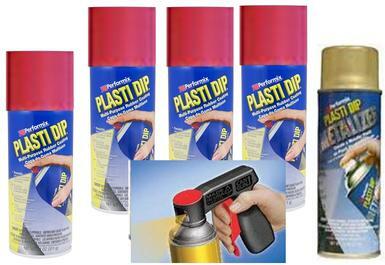 Plasti Dip comes in regular or pre-thinned sprayable formulas. The pre-thinned Plasti Dip is a mix of 1 part Plasti Dip and 1 part Plasti Dip Thinners. We do not recommend any other type of thinners. DO NOT use car paint thinners as this will damage the paintwork on the vehicle. We recommend you wash the vehicle with warm water and dishwashing liquid. If there are any greasy or waxy areas we recommend using rubbing alcohol to remove them. Do not use a car wash with silicone to clean the vehicle before spraying as Plasti Dip will not stick to silicone. We suggest you mask up any areas that you do not want coated and cover your wheels, brakes, etc., if you are not removing the wheels. The Plasti Dip can then be applied. You will need a spray gun that will run at 20psi with a 1.3-1.5mil needle, maximum 2mil needle. If the Plasti Dip comes out of the gun at a high psi the Plasti Dip will dry before hitting the surface and will give a sandpaper finish. Also, we recommend that the spray gun be 6-8”away from the surface, otherwise again the Plasti Dip will dry before hitting the surface and give a sandpaper type finish. If you get runs you are probably too close or spraying too heavily. It is recommended that you remove any tape whilst the last coat of Plasti Dip is still wet to avoid the Plasti Dip sticking to the tape. A small vehicle uses approx. 2 x 3.78 litres of Pre-Thinned Sprayable Formula, a medium vehicle 3 x 3.78 litres and a large vehicle 4 x 3.78 litres and a larger 4WD 5 x 3.78 litres. These are a guide only as there are many variables such as overspray. If you are putting a light coloured Plasti Dip over a dark coloured vehicle you will probably use more. It is recommended to put a base of grey Plasti Dip on first if you are putting a light colour over a dark colour to stop the dark colour showing through. This should also decrease the amount of the lighter coloured Plasti Dip required. If you are using powders it is strongly recommended to put them over several coats of regular Plasti Dip as the powders can discolour the cars paintwork. If you are applying Plasti Dip over a bare metal surface we recommend you use the Plasti Dip Primer first, once touch dry the Plasti Dip needs to be applied to get maximum adhesion. We DO NOT recommend you use Plasti Dip Primer on vehicles if you wish to remove the Plasti Dip at a later date. We recommend 5-7 spray coats of Plasti Dip to ensure a thick enough coating so that it can be easily removed if/when required. It will take approx 4 spray coats to start to get good coverage.